We have recently started a weavers and spinners gathering the 2nd Monday of every month, partly to help help our group of weavers who rent studio space, make sure that we have some time in the studio together. 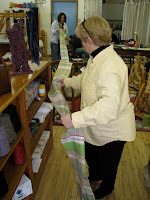 Also to open our studio up to other weavers and spinners; to drop in with their wheels or projects to see what we are up to and share what they have been working on. brought in a recently finished project. Its a beautiful and joyful….banner. Not really sure what Susan called it, but it was a joy to see. All 20 some feet of it. You go girl! Anytime I feel I need a jump start on inspiration I take a trip to Susans shop/studio. There are always so many colors and textures to absorb and Susans energy and spirit helps me find the focus to get back to my own weaving. I feel that Kindred Threads is partly here because of the fiber and creative inspiration that she has given me over the years. 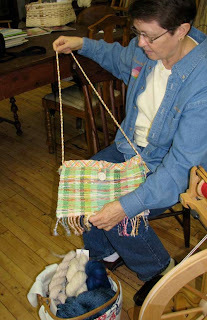 Joyce Krueger of Sunset Hill Studio stopped in to spin with us for awhile and shared a rag purse that she had finished recently. 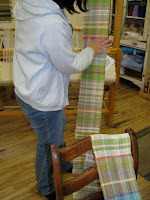 Her handspun were a delight to see and expertly done. She will be a vendor at the Driftless Art Fair again this year. I will look forward to seeing her there. All in all a very enjoyable day. If you are in the area on the 2nd Monday of the month feel free to stop and visit from 11:00-3:00. What a wonderful thing you all have going. The sense of communit is wonderful, and the ability to really do more than just share space has got to feel fabulous. Creativity breeds more creativity. You gals rock! I live close to Joyce! It’s so nice to see a picture of her online. The inspiration is mutual! 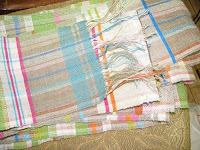 Color, texture, design, and lots of conversation=world peace.